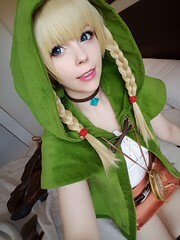 I am a huge Zelda Fan and the moment Linkle’s deisgn came out I fell in love! 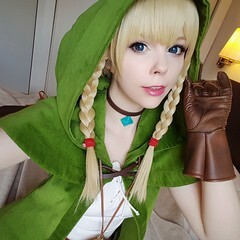 I was not planning to cosplay it until a friend of mine suggested a group togeher (that sadly never happened at the end XD). 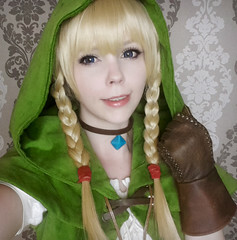 Linkle now became one of my most favorite costumes and also most worn ones. I tried to use textured fabrics that make it look more realistic. The Hoodie is made from cotton velvet, the shirt from linen, the skirt from velour leather and the boots from fake leather. It was also my very first time airbrushing something (I bought the airbrush specially for her boots <3). I am really happy how the weathering on the boots turned out! The crossbows are 3D printed by Forg3d Props and sanded and painted by me. The compass is the original compass from Nintendo from the limited edition of the game. I worked really long on this costume and I totally love it!